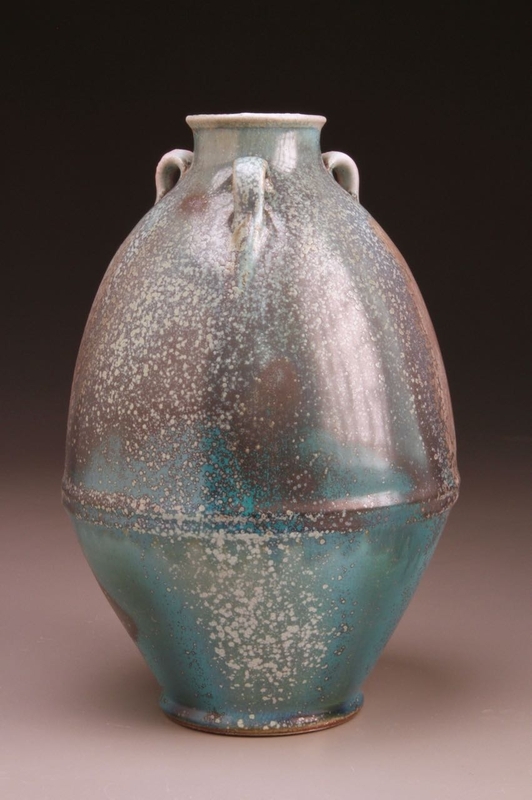 Ben Owen Pottery will be part of the inaugural Seagrove Wood Fire Studio Tour and Sale held June 1st & 2nd, 2019. Hours will be Saturday (9am-5pm) and Sunday (12pm-5pm). New work will be available in a variety of glazes featured for this special studio tour and sale. Come see a wonderful group of potters who have joined together to create a great experience visiting each studio. Enjoy seeing pottery with an emphasis in wood firing. 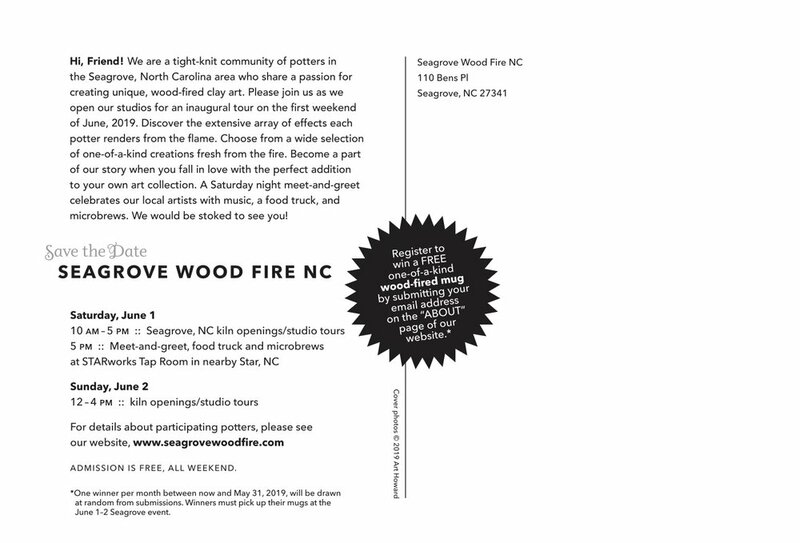 For more info, go to the Seagrove Wood Fire website and the Studio Tour card below. Mark your calendar! Ben Owen Pottery will be starting the fall season with a Kiln Opening on Saturday October 4th, 2019 in conjunction with the celebration of American Craft Week. We will have work in a variety of glazes for this special weekend. Our feature will be our Micro-Crystal glazes, Pomegranate, Chinese Blue, and Chinese Red. The opening will be held 10:00am to 5:00pm on Saturday. A Preview of pottery will be on our website on October 5th after 6pm. Come enjoy some refreshments and see the pots prior to the opening 9am-9:50am on the 6th. Ben will be demonstrating on the potters wheel in the afternoon. Ben Owen Pottery will be participating in the Celebration of Seagrove Potters 12th Annual Festival, in the historic Luck's Cannery in Seagrove. The event will be held Friday evening, November 22nd through Sunday, November 24th, 2019. The Friday Gala will be from 6pm to 9pm and feature early buying opportunities, catered reception, live music and the collaborative auction. The Saturday show is from 9am to 6pm with demonstrations, children's hands-on activities and historical and educational talks. The Sunday show hours will be from 10am to 4pm. This is an all indoor event and promises to be a lot of fun! Ben Owen Pottery will have a Holiday/Christmas kiln openings on December 7th, 14th, & 21st (10am-5pm) featuring a great assortment of glazes and styles for you holiday gift needs. A preview will be held 9am-9:50am and the sale beginning at 10am. Chinese Red, Ash Glaze, Stardust, Dogwood White, and other glazes will be featured for this event. A Preview will be online on November 30th after 6pm. Come visit to see the new work available and enjoy a cup of coffee and other tasty treats! Ben will be a guest artist at the Madison County Potters Market in Marshall, NC held on April 13th. The Market will feature the Potters of Madison County and a guest list including some of the finest potters from the southeast. For more info, go to the Madison County Potters Market website. Ben Owen Pottery will be at the Catawba Valley Pottery Festival Friday March 22 (7-9pm) and Saturday March 23rd (9am-5pm). Ben and Bryan Pulliam will have new work featured from the wood kiln and other finishes. 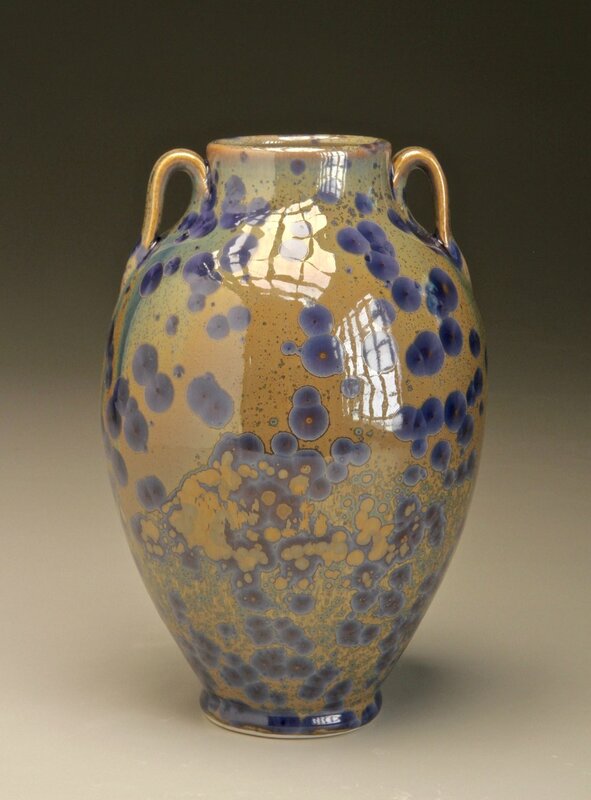 For more information on the event, go to the Catawba Valley Pottery Festival website. Ben will be featured in a new segment for “Pottery Live with Ben Owen III.” For a firsthand look at this art form famous in the Tar Heel state, join Ben Owen III during this live event. UNC-TV’s Shannon Vickery welcomes this renowned artisan as he creates wondrous works of art while sharing the history behind this generations-old Carolina craft. For more information, go to UNC-TV Website. Ben is featured in a new gallery at The Grandover Resort in Greensboro, NC. A selection of work will be represented along with many other artists of the region. A reception will be held on March 7th (6pm-8pm). Come visit the show, some wine tasting and food, and live music. Will be a great evening! For more information, go to The Grandover Resort website. Ben Owen Pottery will have a new kiln opening of Chinese Red along with some other new colors to be featured for that special Valentine gift. Refreshments will be served throughout the day. Ben will demonstrate on the wheel during part of the day. Ben Owen III has been invited to participate in the 14th annual Potters Market Invitational at the Mint Museum of Art in Charlotte, NC, September 8, 2017. 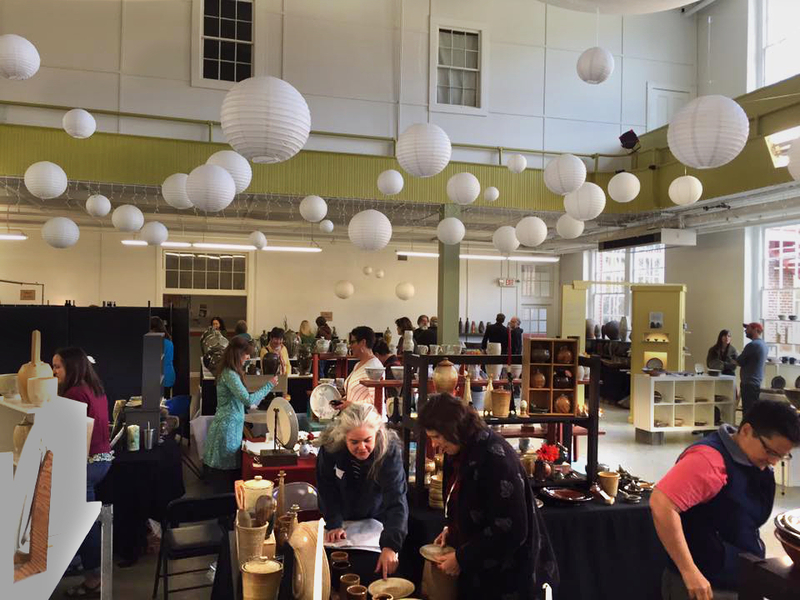 The Delhom Service League has invited 50 North Carolina potters to participate in this intimate selling event. The potters will have their work displayed under a large, spacious tent with plenty of room for potter enthusiasts to move around and view the ceramics. Ben Owen III will be featured with an exhibition of his latest works alongside painter Julyan Davis at Blue Spiral 1 Gallery in Asheville July 5th-August 31st, 2018. An opening reception will be held July 5th (5pm-8pm.) with a gallery talk 5pm-6pm. Ben Owen III will be part of an upcoming exhibition at the Blowing Rock Art & History Museum titled “Handcrafted: North Carolina Clay”. 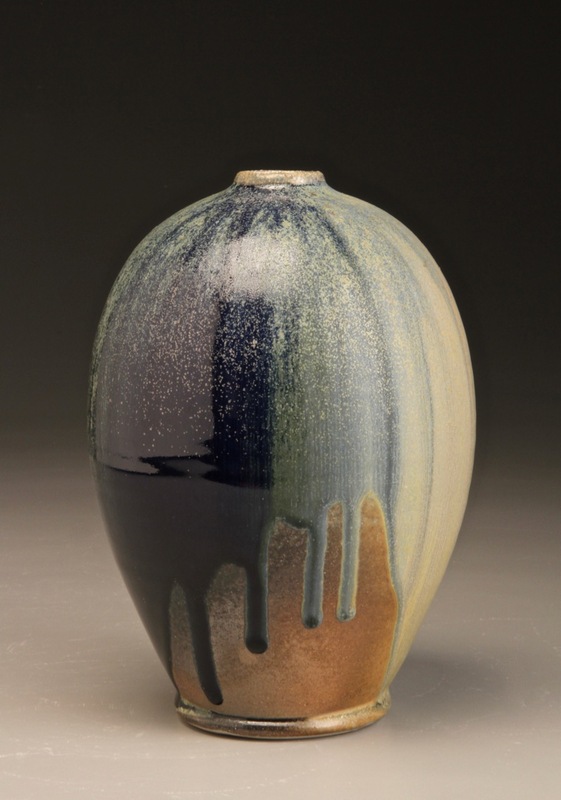 Guest curated by North Carolina potter, Herb Cohen. 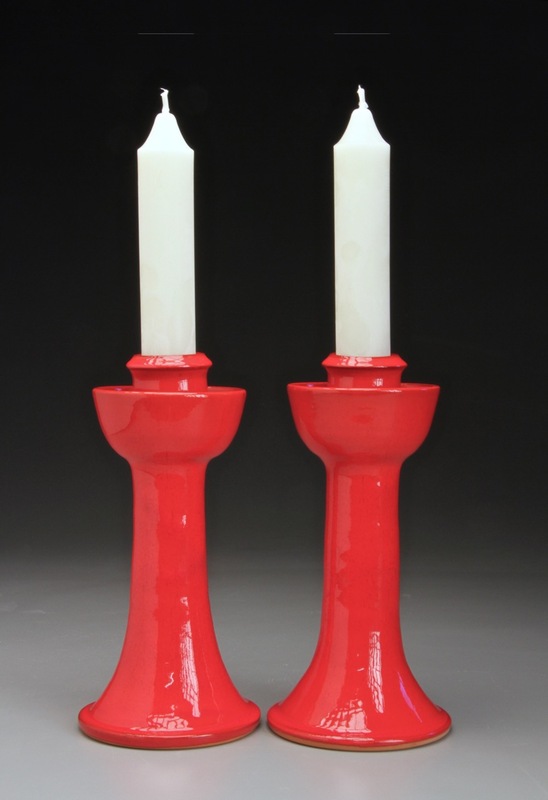 North Carolina has long been recognized for its skilled potters and iron-rich red clay. Potters throughout the state would pull their material directly from the earth and use this clay to form jugs, jars, bowls, platters, and vases, all by hand. Then and now, these utilitarian vessels exist with a sense of humanity, history, and purpose unique to the craft-enriched past of the south. These traditions have both persisted and expanded in potteries and clay studios across the state. “Handcrafted” presents ceramic vessels and sculpture made by over 40 contemporary North Carolina potters and artists. The works are functional and decorative with a broad range of scales, techniques, concepts, and forms. 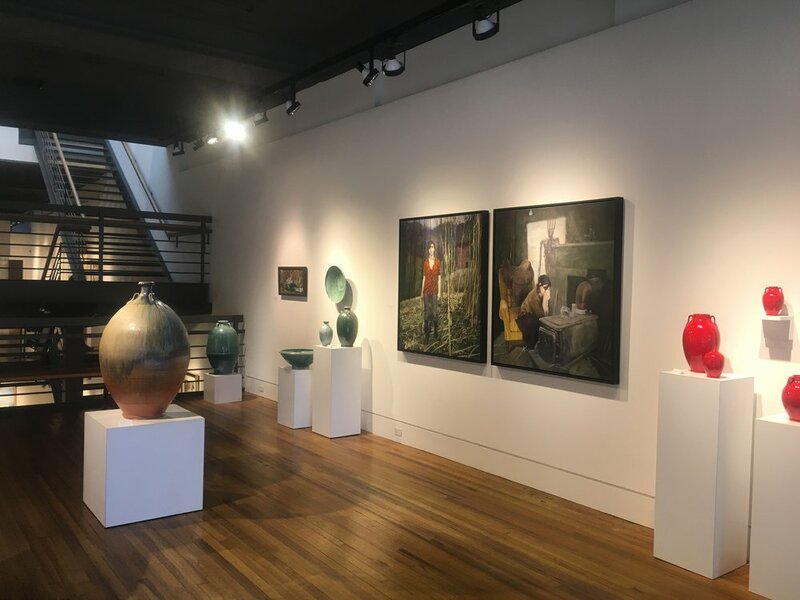 Together, this exhibition takes a look at the diversity of contemporary ceramics in our state, as well as the stories and relationships these artists have with their work and one another. Exhibiting artists include Steve Abee, Michel Bayne, Glenn Bolick, Lula Owens Bolick, Cynthia Bringle, Lisa Clague, Herb Cohen, Josh Copus, Cristina Córdova, Donna Craven, Adrienne Dellinger, Susan Filley, Carol Gentithes, Terry Gess, Mark Hewitt, Lynn Jenkins, Nick Joerling, Daniel Johnston, Fred Johnston, Kate Johnston, Matt Jones, Eric Knoche, Stacy Lambert, Leah Leitson, Jeannine Marchand, Bob Meier, Ben Owen III, Bayle Owens, Pamela Owens, Travis Owens, Vernon Owens, Jane Peiser, Akira Satake, Pat Scull, Ken Sedberry, Jenny Lou Sherburne, Eric Serritella, Liz Summerfield, Charlie Tefft, Kathy Triplett, and Julie Wiggins. Special thanks to Herb Cohen, Lee Rocamora, Carol Gorelick, Bill Little, Clayworks, Inc., Cynthia Bringle Pottery, Jugtown Pottery, and Penland School of Crafts. Ben Owen Pottery will be having a Kiln Opening on Saturday April 21st and Sunday April 22nd, 2018 in conjunction with the Spring Kiln Opening weekend for many of the Seagrove Area Potters. We will have new work from a variety of kilns for this special weekend. The opening will be 10:00am to 5:00pm on Saturday. Sunday hours will be 12–5pm. A Preview of pottery will be on our website on April 20th after 6pm. 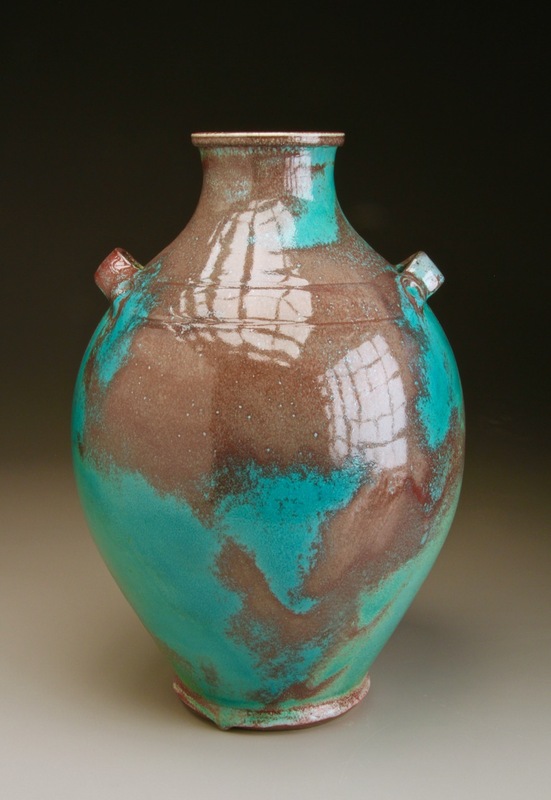 The Seagrove Area Potters will be having the 10th Annual Kiln Opening all weekend. For more info and directions, go to Seagrove Spring Kiln Opening. Ben Owen Pottery will be at the Catawba Valley Pottery Festival Friday March 23 (7-9pm) and Saturday March 24th (9am-5pm). Ben, Benjamin IV, and Bryan Pulliam will have new work featured from the wood kiln and other finishes. For more information on the event, go to the Catawba Valley Pottery Festival website. Pucker Gallery in Boston showcases Ben’s pottery in an exhibition featuring new work for 2018. Opening reception will be held on February 3rd, 2018 (3pm-6pm). Ben will give a presentation in the gallery on Sunday February 4th (2pm-4pm). 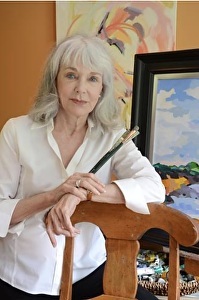 For more information, go to Pucker Gallery website. Ben has been invited to share his process in clay at Harvard University prior to the opening of his exhibition at Pucker Gallery.. The workshop and lecture will be held on February 1st (1pm-6pm). For more information, go to Harvard Ceramics website. Ben Owen Pottery will close for Christmas December 24th-27th. We will re-open December 28th-30th (10am-5pm). Wishing you and your family a Merry Christmas and Happy Holidays! Ben Owen Pottery will be starting the fall season with a Kiln Opening on Saturday October 14th and Sunday October 15th, 2017 in conjunction with the celebration of American Craft Week. We will have work in a variety of glazes for this special weekend. Our feature will be Chinese Blue, Ash, Blue Celadon, Chinese Red, and Speckled Trout. Bryan Pulliam, our studio and alchemy assistant, will feature his work this weekend with some of his popular Black & White along with some of the Polychrome glazes. Bryan is a great welcome to our team and you will enjoy getting to know him. The opening will be held 10:00am to 5:00pm on Saturday. Sunday hours will be 12–5pm. A Preview of pottery will be on our website on October 13th after 6pm. Come enjoy some refreshments and see the pots prior to the opening 9am-9:50am on the 14th. Our retail manager, Susan Chriscoe, will be retiring from Ben Owen Pottery this month. We will miss her and the laughs and smiles she would always have for visitors. We wish her many blessings and some much deserved rest along with more time with her family! Seagrove has recently been given the title of #1 Town for Craft Lovers! Tang Style Vase in Chinese Blue-Red 12" tall.